Was there an event or person in your life that shaped your political views? Have your political views changed over time? Was there something specific that made you change? 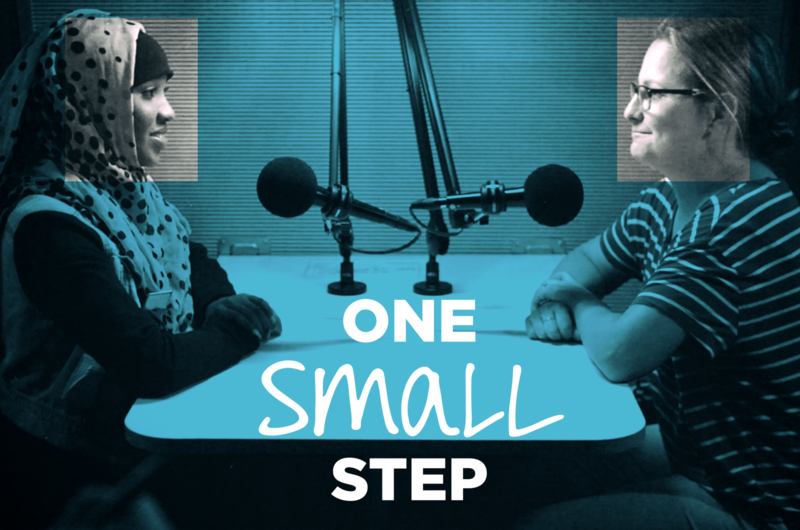 These are the types of questions you could ask, and be asked, if you are chosen to participate in "One Small Step," a national project launched by StoryCorps to break down boundaries created by politics. KCUR is one of just six stations across the United States chosen to participate in this exciting initiative. Things are toxic in our country; there’s mutual distrust, people feel unheard, and disconnected. We’re concerned about this, we think many people are and we’re trying to do something about it. "One Small Step” simply puts two people, on opposing sides of the political spectrum, together for a facilitated and recorded conversation. These conversations are not debates or a “talk about politics.” The goal is for people to share personal stories about how they came to believe what they do. We’re looking for people passionate about their beliefs, but open to hearing other perspectives, who might really like to be a part of something like this. What other people are sharing about "One Small Step"
​People interested in being a part a conversation will fill out the potential participant survey. This survey is used to pair people to facilitate the best conversation possible. If you’re paired, a KCUR producer will reach out to each participant and work to set up a mutually convenient time and location for the recording/conversation. The producer will also share some additional information so all participants feel prepared and have opportunity to think about their questions for each other. Recordings start in March and continue through July. During the recorded conversation a KCUR producer will share some brief paper work, explain how the recording will happen and typically help begin the conversation with one to three starter questions. After that the participants drive the conversation with questions of their own. The recording lasts about 40 minutes, the whole process takes up to an hour. Each participant will receive a digital copy of the interview. If both participants chose, the interview is also preserved at the Library of Congress in Washington, DC and could be selected for editing and public broadcast. WHOM SHOULD I BRING TO THE INTERVIEW? KCUR will use a screening survey to find a partner for you for the interview, unless you have been instructed otherwise. HOW CAN I PREPARE FOR MY INTERVIEW? "One Small Step" sessions are not scripted. They are intended to be natural conversations. It is a good idea to spend some time before your interview thinking about what questions you want to ask or topics you want to explore. We will provide some suggested questions. Consider bringing your own list of questions. But do not over-prepare. Just come ready to be yourself. HOW LONG IS THE INTERVIEW? The interview itself is 40 minutes long. There is some paperwork you will need to fill out before and after the interview, so the entire process takes about one hour. IS KCUR STAFF PRESENT DURING THE RECORDING SESSION? A trained facilitator is present throughout the entire interview process and handles all technical aspects of the recording. Facilitators also help ensure that you have a comfortable and meaningful experience. WILL MY STORY BE EXCERPTED FOR THE PUBLIC TO HEAR? With permission from participants, KCUR or StoryCorps may choose to edit your conversation for broadcast, however, only a very small percentage of recordings are ever broadcast on the radio. WHAT IF I DO NOT WANT MY STORY TO BE ARCHIVED? If you do not sign the release form, you will receive the audio, the interview will not be archived and we will not keep a copy. Regardless of whether or not you sign the release form, each interview participant will receive the audio of the conversation to share with family and friends. StoryCorps is a national nonprofit organization whose mission is to preserve and share humanity’s stories in order to build connections between people and create a more just and compassionate world. Since 2003, over 400,000 people have shared life stories with family and friends through StoryCorps. As part of StoryCrops’ signature service, participants receive a copy of their new recording to share and, with permission, StoryCorps sends a second copy to the Library of Congress. StoryCorps is one of the largest oral history projects of its kind, and millions listen to our weekly broadcasts at STORYCORPS.ORG and on NPR’s Morning Edition. StoryCorps also create award-winning animations that are viewed online and via public and digital media. To learn more about StoryCorps, please visit https://storycorps.org/about.